Websites and applications are notorious for taking practically any type of input, mistakenly assuming that it’s valid, and processing it further. Not validating input is one of the greatest mistakes that web developers can make and one of the finest tools in a hackers toolkit. Several attacks that insert malformed data — often, too much at one time — can be run against a website or application, which can confuse the system and make it divulge too much information to the hacker. Input attacks can also make it easy for the bad guys to glean sensitive information from the web browsers of unsuspecting users. A typical login session involves a valid login name of 12 characters or fewer, but the maxsize variable can be changed to something huge, such as 100 or even 1,000. Then an attacker can enter bogus data in the login field. What happens next is anyone’s call. The application might hang, overwrite other data in memory, or crash the server. A simple way to manipulate such a variable is to step through the page submission by using a web proxy, such as built into the commercial web vulnerability scanners or the free Burp proxy. Web proxies sit between your web browser and the server you’re testing and allow you to manipulate information sent to the server. To begin, you must configure your web browser to use the local proxy of 127.0.0.1 on port 8080. To access this proxy in Mozilla Firefox, choose Tools → Options, scroll to the bottom of the Options dialog box, and select Settings in the Network Proxy section, Next, select the Manual Proxy Configuration radio button. 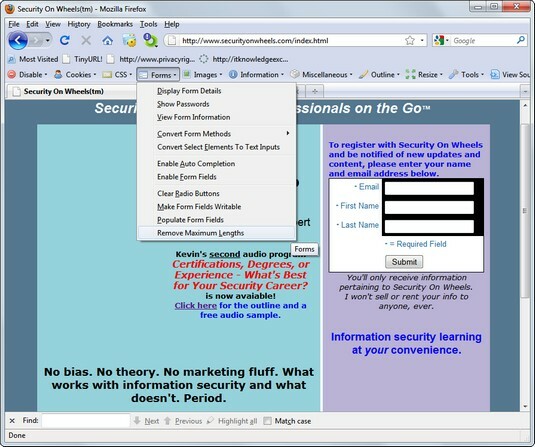 In Internet Explorer, click the gear icon and choose Internet Options from the drop-down menu; in the resulting dialog box, click the LAN Settings button in the Connections section, select the Use a proxy server for your LAN radio button, and enter the appropriate host name/IP address and port number. All you have to do is change the field length of the variable before your browser submits the page, and the page is submitted using whatever length you give. You can also use Firefox Web Developer add-on to remove maximum form-field lengths defined in web forms. Using Firefox Web Developer to reset form-field lengths. It’s important to note that most recent application platforms, such as ASP.NET and Java, are pretty good about not allowing such manipulation of the URL variables, this vulnerability can still be found from time to time. In both situations, an attacker can exploit the vulnerability by sending the link to unsuspecting users via email or by posting it on a website. When users click the link, they can be redirected to a malicious third-party site containing malware or inappropriate material. If you have nothing but time on your hands, you might uncover these types of vulnerabilities manually. In the interest of accuracy (and sanity), however, these attacks are best carried out by running a web vulnerability scanner, which can detect the weakness by sending hundreds of URL iterations to the web system very quickly. To see the source code in Internet Explorer and Firefox, right-click the page and choose View Source or View Page Source from the contextual menu. A hacker might change a price from $100 to $10, for example. Repost the page to the server. This step allows the attacker to obtain ill-gotten gains, such as a lower price on a web purchase. Such vulnerabilities are becoming rare, but like URL manipulation, the possibility for exploitation exists, so it pays to keep an eye out. Using hidden fields for authentication (login) mechanisms can be especially dangerous. An ethical hacker once came across a multifactor authentication intruder lockout process that relied on a hidden field to track the number of times the user attempted to log in. This variable could be reset to zero for each login attempt and thus facilitate a scripted dictionary or brute-force login attack. It was somewhat ironic that the security control designed to prevent intruder attacks was vulnerable to an intruder attack. Several tools, such as the proxies that come with commercial web vulnerability scanners and Burp Proxy, can easily manipulate hidden fields. If you come across hidden fields, you can try to manipulate them to see what can be done. It’s as simple as that. This example is rudimentary. Nonetheless, the web application may respond in a way that gives hackers more information than they want, such as detailed errors or access to data fields that they're not authorized to access. The invalid input may also cause the application or the server to hang. Attackers can use this information to find out more about the web application and its inner workings, which can lead to a serious system compromise. A web application used to manage personal information once presented this very problem. Because a "name" parameter was part of the URL, anyone could gain access to other people’s personal information by changing the "name" value. If the URL included "name=kbeaver", a simple change to "name=jsmith" would bring up J. Smith’s home address, Social Security number, and so on. Ouch! The system administrator was alerted to this vulnerability. After a few minutes of denial, he agreed that it was indeed a problem and proceeded to work with the developers to fix it. Code injection can also be carried out against back-end SQL databases in an attack known as SQL injection. Malicious hackers insert SQL statements — such as CONNECT, SELECT, and UNION — into URL requests to attempt to connect and extract information from the SQL database that the web application interacts with. 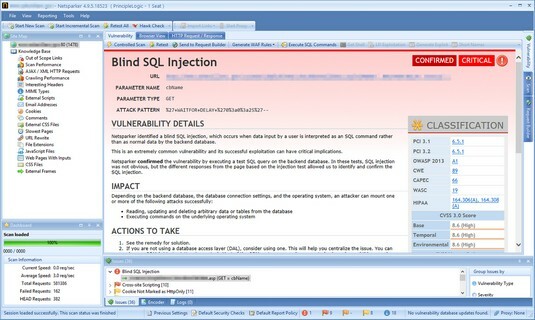 SQL injection is made possible by applications’ failure to validate input properly combined with informative errors returned from database servers and web servers. A quick (although not always reliable) way to determine whether your web application is vulnerable to SQL injection is to enter a single apostrophe (’) in your web form fields or at the end of the URL. If a SQL error is returned, odds are good that SQL injection is present. You’re definitely going to get what you pay for when it comes to scanning for and uncovering SQL injection flaws with a web vulnerability scanner. As with URL manipulation, you’re much better off running a web vulnerability scanner to check for SQL injection, which allows an attacker to inject database queries and commands through the vulnerable page to the back-end database. The image below shows numerous SQL injection vulnerabilities discovered by the Netsparker vulnerability scanner. Netsparker discovered SQL injection vulnerabilities. The neat thing about Netsparker is that after it uncovers SQL injection, you can use the built-in tool Execute SQL Commands to further demonstrate the weakness. A screens hot of SQL injection in action is about as good as vulnerability and penetration testing gets! When you discover SQL injection vulnerabilities, you may be inclined to stop there without trying to exploit the weakness. That’s fine. But you may as well see how far you can get. Try using any SQL injection capabilities built into your web vulnerability scanner if possible so that you can demonstrate the flaw to management. If your budget is limited, consider using a free SQL injection tool such as SQL Power Injector or the Firefox add-on SQL Inject Me. An XSS attack can display the user ID and password login page from another rogue website, for example. If users unknowingly enter their user IDs and passwords in the login page, the user IDs and passwords are entered into the hacker’s web server log file. Other malicious code can be sent to a victim’s computer and run with the same security privileges as the web browser or email application that’s viewing it on the system. The malicious code could provide a hacker full read/write access to browser cookies or browser history files, or even permit him to download or install malware. If a window pops up that reads XSS, the application is vulnerable. The XSS-Me Firefox Add-on is a novel way to test for this vulnerability as well. Script code reflected to the browser. Using Acunetix web Vulnerability Scanner to find cross-site scripting in a web application. 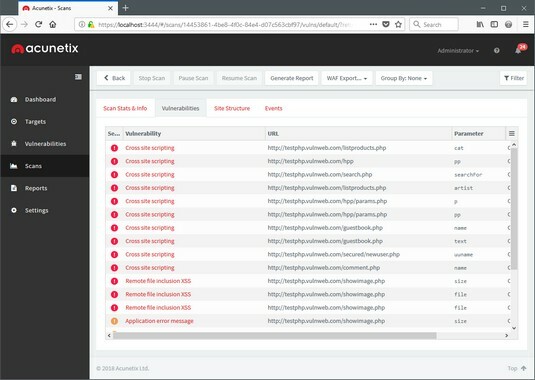 Another web vulnerability scanner that’s good at uncovering XSS that many other scanners won’t find is AppSpider (formerly NTOSpider) from Rapid7. AppSpider works better than other scanners at performing authenticated scans against applications that use multifactor authentication systems. AppSpider should be on your radar. Never forget: When it comes to web vulnerabilities, the more scanners, the better! If anything, a hacker may end up using one of the scanners that you don’t use. Websites and applications must filter incoming data. The sites and applications must ensure that the data entered fits within the parameters that the application is expecting. If the data doesn’t match, the application should generate an error or return to the previous page. Under no circumstances should the application accept the junk data, process it, and reflect it to the user. Never present static values that the web browser and the user don’t need to see. Instead, this data should be implemented within the web application on the server side and retrieved from a database only when needed. Filter out <script> tags from input fields. Disable detailed web server and database-related error messages if possible.